The last time this “A Little About Me” section was updated was in 2016 before giving my life to Christ. As you can see, this is all about me, my accomplishments, and my life. Since then, I have died to this life and been reborn in Jesus. My life is no longer about me but about Him. I no longer boast about my accomplishments but about what He has done in my life. This site needs a complete overhaul which is going to take a bit of time. However, I have things I want to post about my walk with the Lord, about responses I have made to others regarding my faith and more. So in case anyone stumbles across an article and wants to learn more about me, it’s coming. I just have more important things to do now, like share the Good News of Jesus with as many as I can! Originally I just wanted to journal my daily activities. I’m a pretty active person and I thought this would be a great way to help me remember all the fun things I do every day. Richard, my loving husband; wonderful father to our beautiful daughter Gracie; and all around tech guy, thought I should start a blog instead of just keeping it saved on the computer somewhere. So started Karen Loving Life – and a little about me. Born and raised in Tacoma, Washington I left the grey, wet skies of the Pacific Northwest and moved to beautiful sunny, Lake Havasu City, Arizona. I am a very active person and love to encourage and motivate others to be active as well. 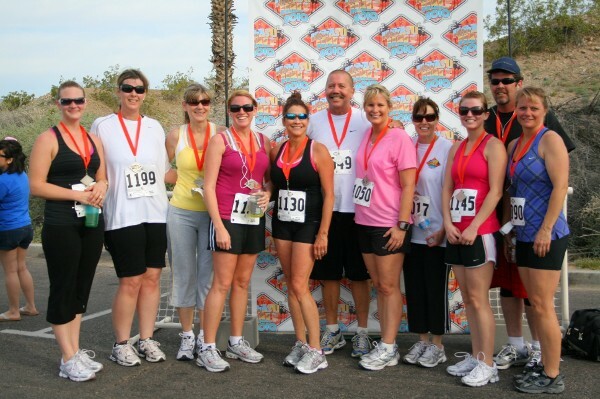 I started the Havasu Hustlers Run Club in 2007 and grew it to more than 200 members and over 400 likes on Facebook. 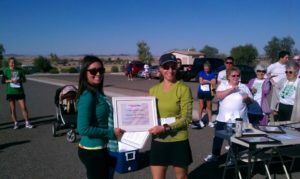 For a few years I held a free 10 week beginners run program. 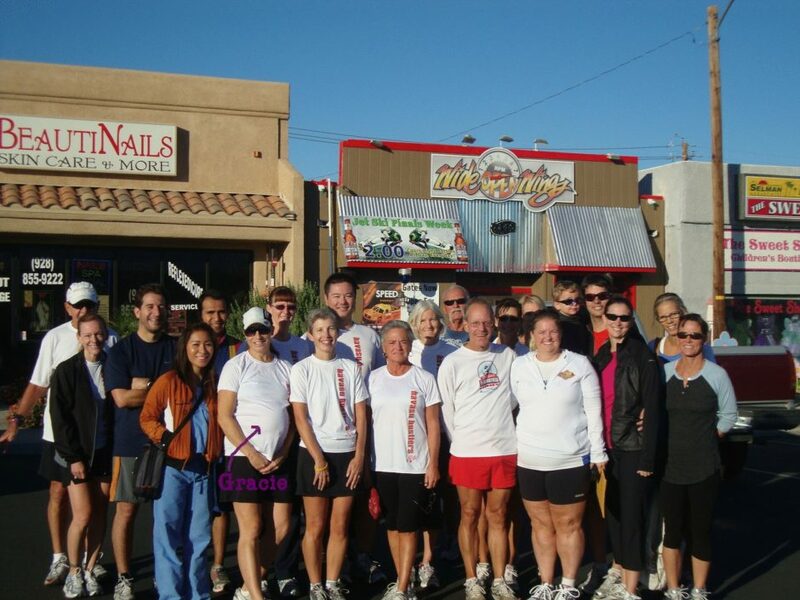 Once the program ended, most of these beginners ended up running their first 5k race just a week after the class which was such a reward! Beginner Run Program Graduates complete their first 5k! After a fulfilling 12 years in Lake Havasu, it was time to leave the heat and move to our dream town and raise our daughter. So in 2014 we made the move to Bend, OR. I’m what I’d consider the everyday athlete. As much as I would love to make running and cycling a career, it’s just not in the cards for me so I do a little every day – more when there is a race I’m gearing up for. But in general, I’m like most of you out there – trying to fit running and exercise in between family and work, dealing with the weather and time constraints. 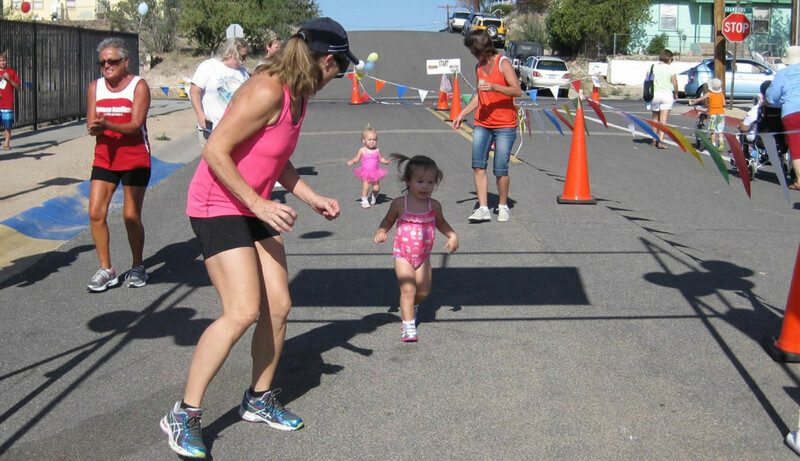 Although not the fasted female runner, cyclist or triathlete I am competitive by nature and in the small town of Lake Havasu, was often an age group winner at most local events. However, with so many more active and retired athletes in Bend, I’m quickly learning that’s not the case here. A finish time that would get me in the top three age-group in Havasu might get me in the top 10 in Bend! I love life and enjoy time with friends along with a cold beer or glass of wine so I don’t take it to seriously when I don’t place. Life is about enjoying the things you do and I love training; when I place or podium it’s just the icing on the cake. I am the mother of a beautiful girl Gracie. I ran my first marathon when I was five months pregnant with her (and 41 years old) and managed to finish in a respectable 4:34:26. She loves to hear the story of “running with mommy” in my belly. I’ve ran 4 total – the first one, Utah Valley Marathon, I was pregnant with Gracie; I ran my second marathon, the San Diego Rock-n-Roll Marathon, the next year, just 8 months postpartum, and knocked 18 minutes off, running a 4:16:24, all while being sleep deprived from nursing through the night. My third marathon, Mountains 2 Beach, was my most disappointing in that I was in the best race shape I had ever been in and was looking at a 3:40-3:50 finish and a Boston Qualifier. Unfortunately I came down with the flu two days before race day but still attempted to BQ. Although I finished, it was painful and 30 minutes over my goal. However, I did finally manage that Boston Qualifying time on my fourth attempt at the Phoenix Marathon February 2015. I’ve been running for over 30 years (I entered my first 12k road race when I was 13) and I love running the half marathon distance or less. I prefer short and fast as opposed to long and slower. My PR for a half is 1:51:43, 10k PR is 48:49 and I have a 22 minute 5k PR. I also love, love, love triathlon! 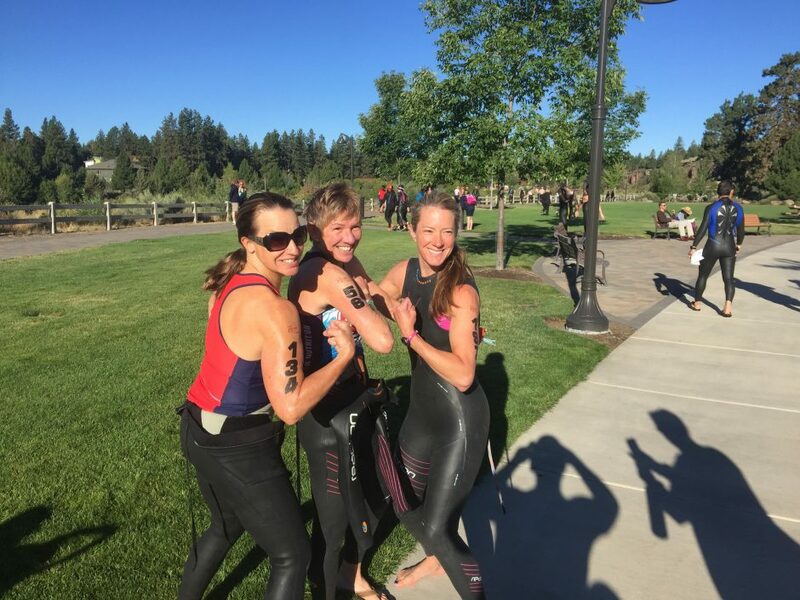 I did my first sprint triathlon at 37 years old, I have a 2:54:59 Olympic distance PR and completed my first 70.3 in barely under 6 hours and good enough for a third place age group finish! I love training for triathlon. Nothing like swimming, biking and running to make you feel super fit and boost your confidence. 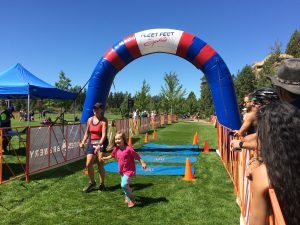 Gracie’s first triathlon at age 1-1/2. Now that you know a little about me, it is my hope that by you reading my posts; giving my opinions on certain training programs or products; experiencing training for and completing a race; it’ll help motivate and encourage you to get out there and do it too! Welcome to my blog – enjoy the journey! PS – For real-time updates, follow me on twitter @kareniddings!